Cookbooks come on all different varieties, but the most enjoyable are the ones with good pictures and good writing as opposed to a laundry list of recipes with no explanations of where or who they came from. 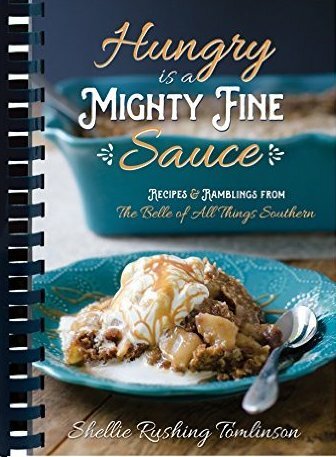 Hungry is a Mighty Fine Sauce is one of those excellent cookbooks that is readable, and definitely exposes the adorable personality of the author. Southern cooking is always good, but this book makes it even better, and has a variety of great recipes for everyone, even picky eaters. There is a recipe for Cajun Tater Salad that l have already served several times; it’s different, slightly spicy, and really good. My favorite recipe from the book is called Jessica’s Scrumptious Skillet Cookie, which is a giant cookie mixed on the stovetop in a cast-iron skillet, then briefly baked. It takes about 10 minutes to assemble, and the finished result is fabulous. It was so easy and good, that I have since made several variations adding ingredients like peanut butter, oatmeal, raisins, etc. I even discovered that it can be baked in the barbecue grill when I don’t want to heat up the kitchen. The recipes are written in an easy-to-understand style, and are simple to follow. One problem I did find while trying several recipes in the book, was that the Berry Breakfast Bread needed to be baked at a lower temperature for much longer than 20 minutes (20 minutes produced a doughy, raw cake) – more like an hour at 350º rather than 400º because by the time the center was set, the top was over-browned. Once I changed the baking temperature and baking time, the cake was delicious and was devoured by my family and friends. All told, this is a delightful cookbook, and one that is fun to read as well as fun to cook from. The pictures are beautiful, and the stories and vignettes are entertaining. If you love Southern cooking, and want to prepare food that is down-to-earth and delicious, this book is highly recommended.